← Start a fire, advent conspire, and more from this last COWO mtg (including an update on serving together this Nov & Dec). 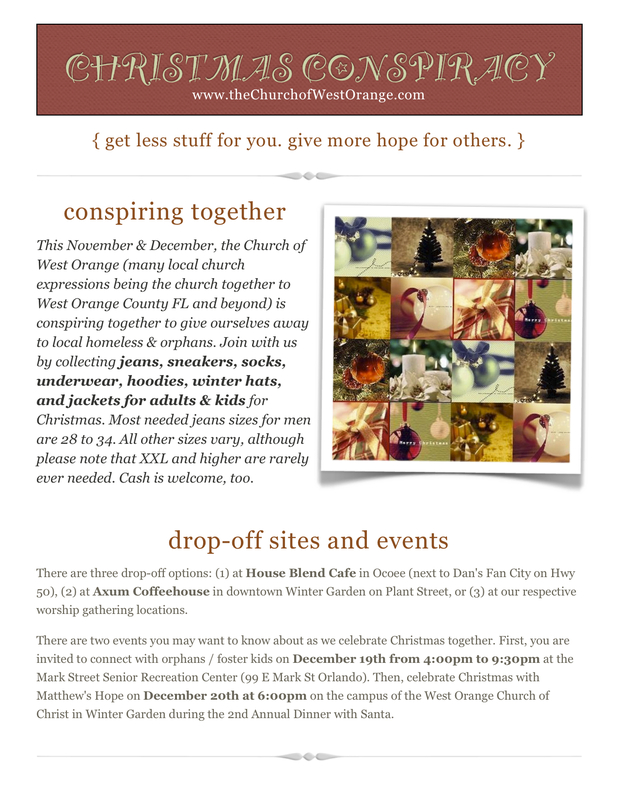 The Church of West Orange, inspired by the “Advent Conspiracy” efforts of several church families out of Houston, TX from several years back, is once again conspiring together to get less stuff and give more hope this Christmas! You may remember last Christmas when we joined together to raise $11,000 to build a well in Chapa, Ethiopia. Well, this year we are going local focusing on the homeless and orphans right here in Central FL. Check out the intro video below. Then, check out the info on the flyer below that. Then let’s get to it – both conspiring together as well as giving ourselves away! PS _ if you want to download the intro video to show, go to KeepVid.com, copy the video URL from YouTube, paste it in the blank box on the KeepVid website, then click to download a high quality version of the video. Holler at me with any questions.